All I knew about the Ram Brewery when I moved into my flat in Wandsworth in 2009, was that it was a landmark that I associated with driving into London from Surrey with my family when I was younger, along with the boarded up Zodiac record shop on the corner of Fairfield Street that no one seems to have ever seen open and trading, even when they were. It turned out that the husband of the couple I bought my flat from had been an ex employee of the brewery and had been made redundant as a result of the brewery’s closure two years prior. I then discovered that it had been home to one of London’s oldest breweries, the Youngs Brewery, who had continued to deliver beer locally using shire horses up until its closing. I would later discover that it is actually the longest continuously brewing site in Britain and that it has been going since at least 1533. Around that time I was going through my Belgian beer phase. My go to beer was Leffe along with the occasional pint of Doombar so my mind wasn’t really on British beer all that much. However around four years later, my interest in cask beer had been reignited and my interest in the new craft beer scene in London was peaking. My favourite cask beer was Tommy, an IPA brewed by A Head in a Hat whose owner Peter used to brew at The Florence pub in Herne Hill and coincidentally had offloaded his leftover hops at The Ram when he closed up shop in 2015. One day I was surprised to get a flyer through my door, advertising National Science Week at the brewery which would include an opportunity to try some of the beers being brewed there. Intrigued and having had no idea of any activity still going on at the brewery, I checked Twitter and found the Ram Brewery account. I tweeted them asking if they were still alive and received a response from a mystery person saying they were and that if I sent over my email address I could be notified of any upcoming events. Still intrigued and not knowing in exactly what capacity the brewery was still going, I received an email from a John Hatch, informing me of comedy nights at the brewery which included all the beer you can drink.This sounded too good to be true of course and I could not believe that such a thing was practically happening on my doorstep. I was still completely unaware that John had been working at The Ram for over thirty years. 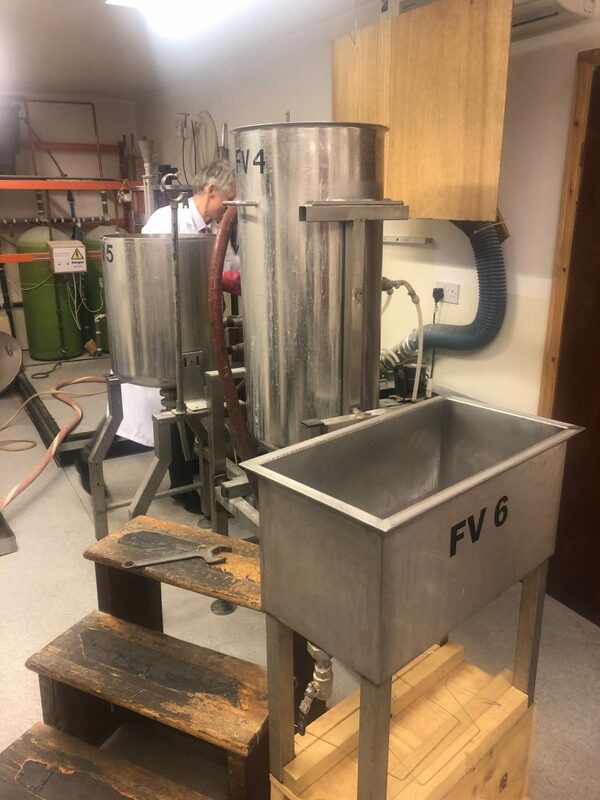 Firstly for 18 years with Young’s and then a further twelve and a half years in the current microbrewery, as a promise to John Young to keep the brewery going for as long as possible. Around six months later, I went along with my mum to see for myself and discovered what is undoubtedly the best (secret) comedy night in London. After attending a couple more of these and spending a trade afternoon at GBBF with John, in December 2018 we agreed to do a collaboration brew and that I could choose the style. 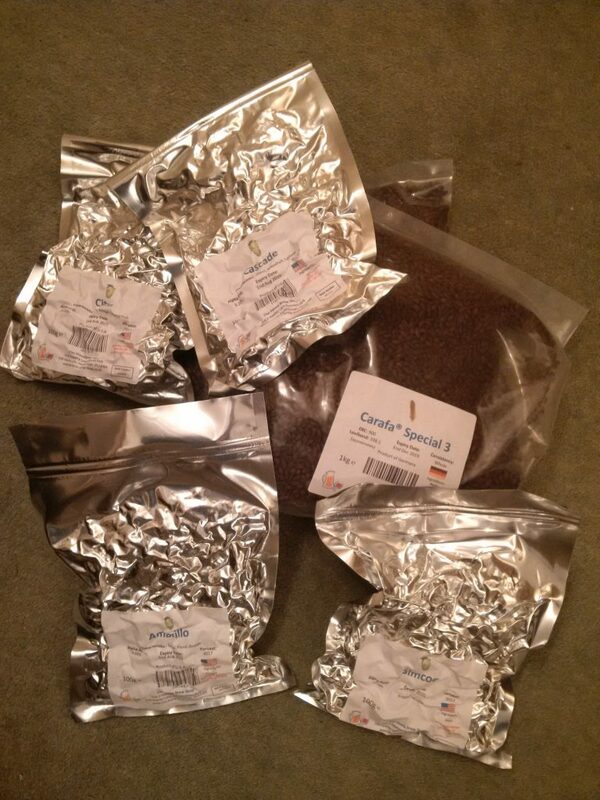 I am very much a novice brewer. I have dabbled over the last few years but the timing could not have been better as I had actually just bought the ingredients to make a black IPA, which is a style that I had not been seeing around as much and love. 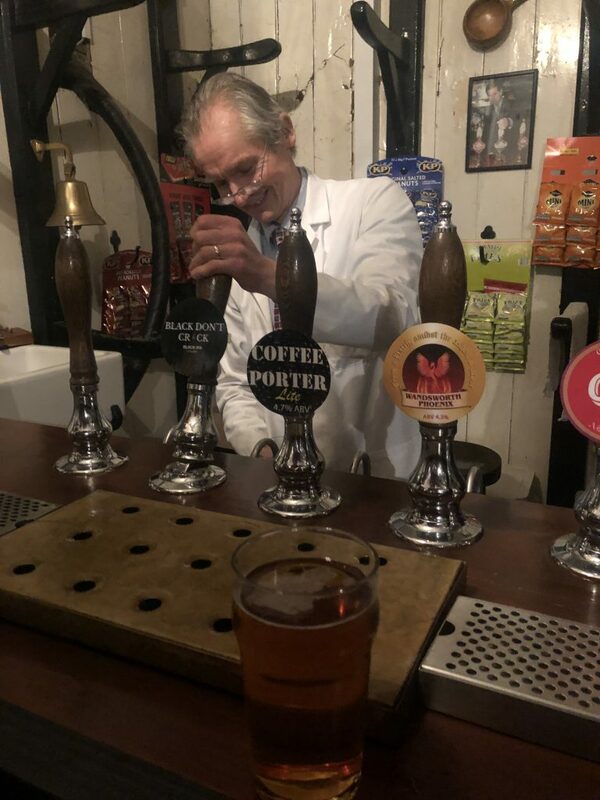 So without hesitation that was the beer I suggested we made, not realising that it was a nearly fatal mistake as this was a man dedicated to sticking to John Young’s philosophy of brewing with solely English malt and hops in the brewery. However John took it in his stride (or caved, not sure which) and accepted the challenge and allowed the introduction of American hops, aside from Citra, for the first time ever into the brewery. John then started setting up the mash tun. The brewery has three fermenters which are pictured below. 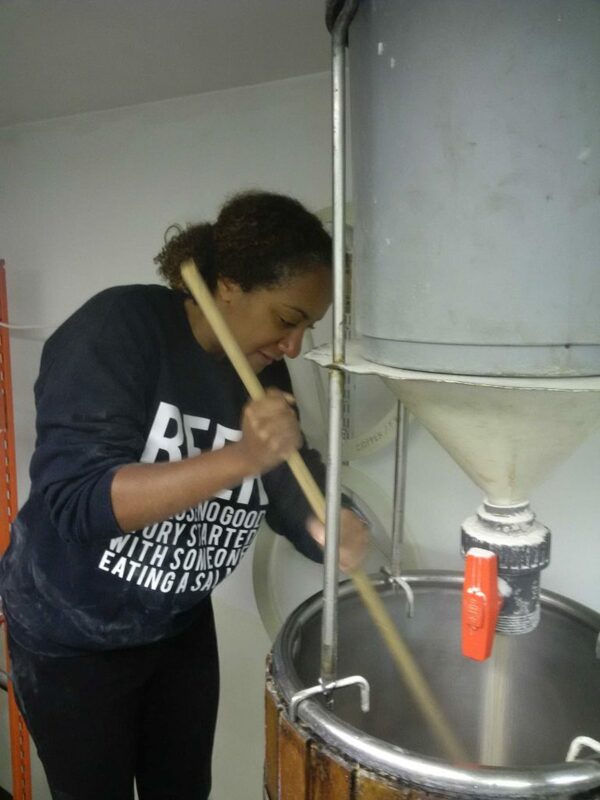 I then climbed up the steps to start mashing in with a big wooden stick. Below is the first sign of the beer, i.e the wort . 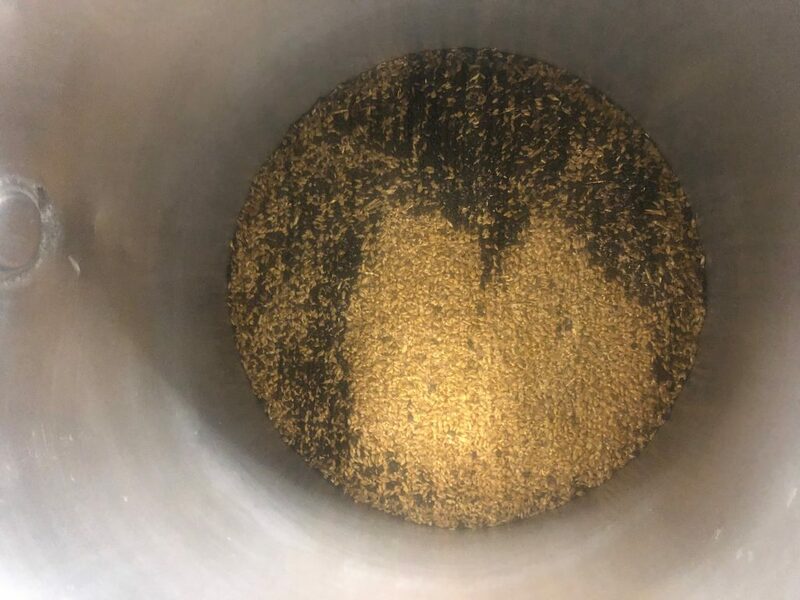 In simple terms this a sugary liquid produced by heating the grain with water which extracts the sugars from the malts which the yeast will later eat and turn to alcohol. We did have a taste at this point and it was sweet as expected with some roasted flavours from the dark malts too. I was excited to see the colour at this point! Spent grain left in the mash tun, some nice food for the farmer’s ‘special’ cow. Can anyone else see a penguin?? I added these to the wort. 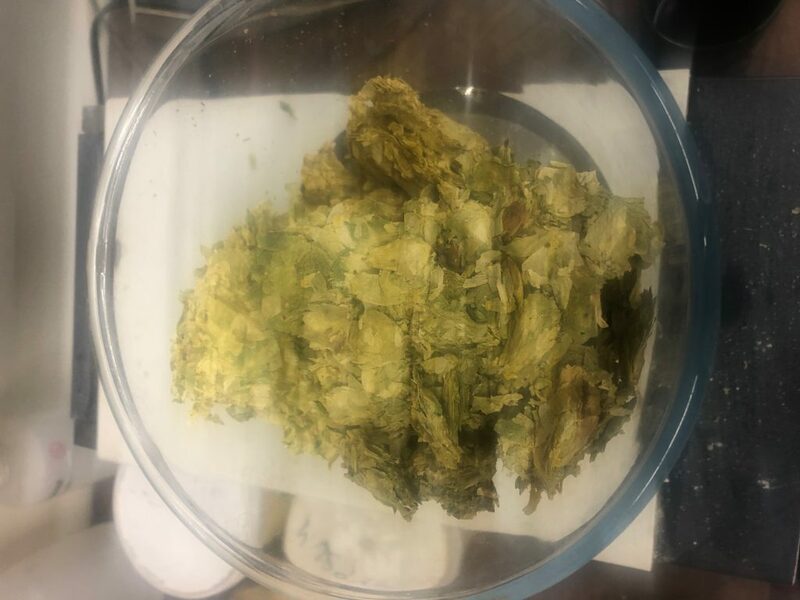 First the bittering hops and then later the aroma hops which give flavour to the beer. We then left the wort to boil while we took a break for a fry up. So by that point which was around lunchtime, our brew was done. 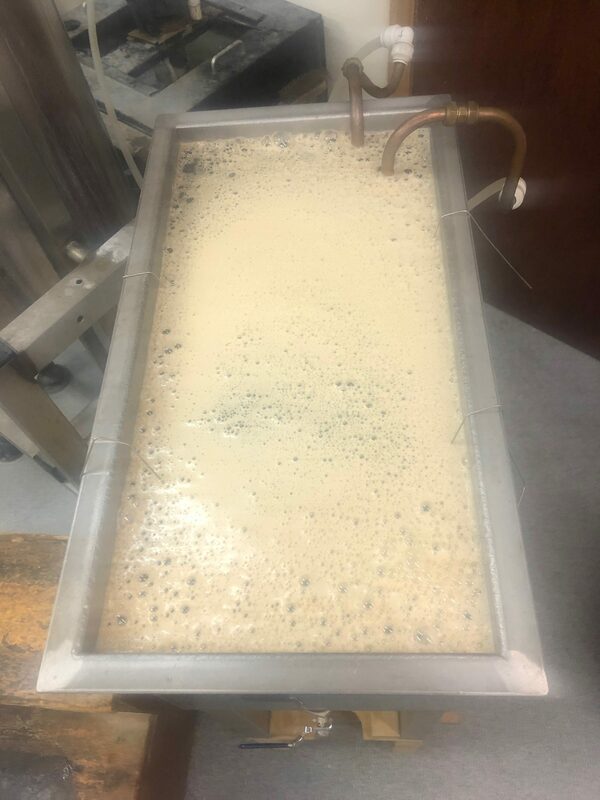 We just had to hope that it would not be too long before the yeast started to do its thing as it was a particularly cold day. As a final honour, John let me enter our ‘recipe’ into The Brewing Book, in which every recipe brewed at the Ram has been logged. The original brewery had a book for every year going back to around 1905, another tradition that John has kept going since the brewery’s closure. 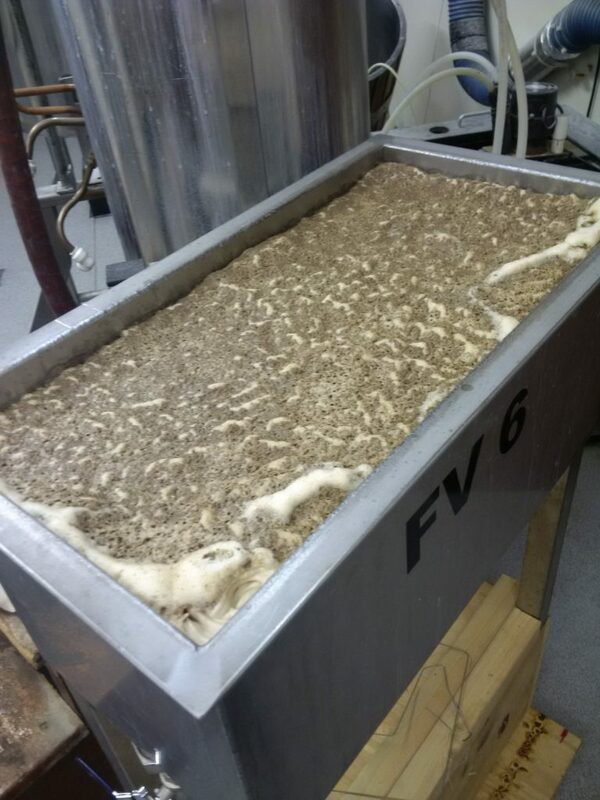 Around 15 hours later, John sent me a photo and the yeast was very much alive and eating away at all the sugars. For those that know the style and from the Black IPAs that I have drunk, they are usually a sort of trick of the mind in that they look like a stout/porter but taste hoppy like a traditional American IPA. So in other words the focus is usually more on the hops rather than the roasted/coffee flavours that the darker malts can bring to the beer. 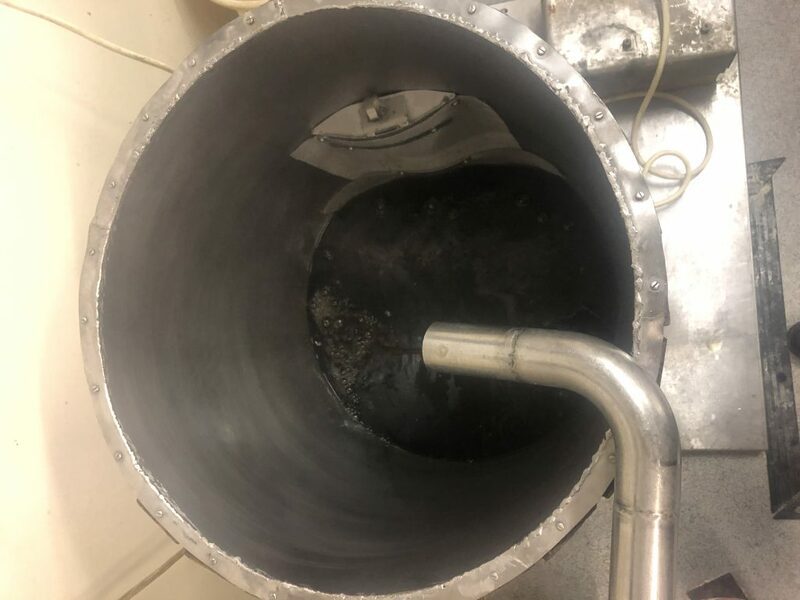 Our beer was perhaps more on the roasty side, as the carafa 3 we used added more of that flavour than expected, in a good way. The flavour from the hops was still there although not so much the main event. Either way we were both pleased with the result and in having created something different for the brewery and for those that dared to try, the beer seemed to go down rather well. The biggest surprise was from a lady who doesn’t normally like or drink beer and in fact only likes Kriek, a Lambic fruit beer made with cherries. Proof that you can possibly convert anyone! Two weeks later it seems the beer was still going from strength to strength and John told me that ‘it took such a hammering’ that it was finished off at the next comedy night with one person putting away four pints of the stuff! Needless to say I am chuffed and will still be attempting to brew one at home. So lastly, cheers and eternal thanks to John, who as far as I know doesn’t regret saying yes to making a Black IPA and here’s to bringing more people over to the dark side and to hopefully more brewing adventures. 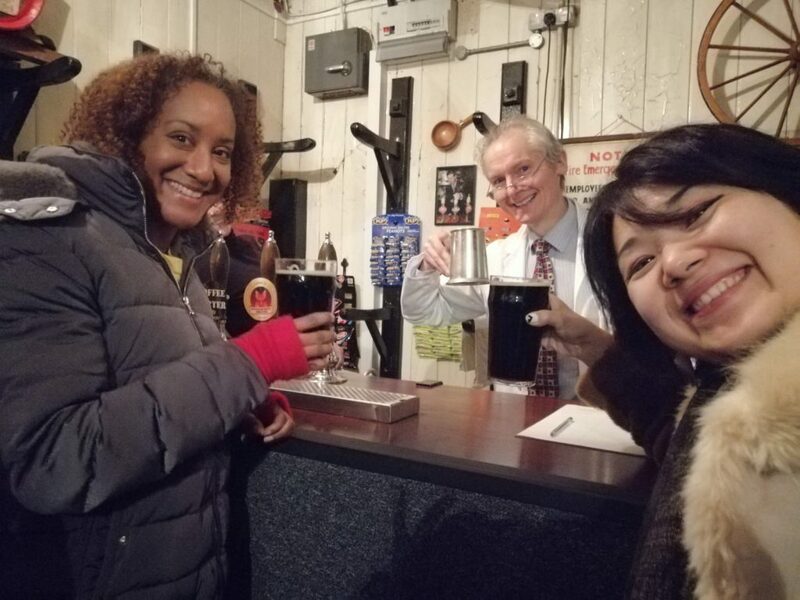 Thanks to Greenland (the developers and site owner) who, inspired by John’s story have allowed him to continue to brew at Britain’s oldest brewery following the brewery’s closure and kept him on as site manager. Greenland are now looking at ways to ensure that brewing will continue into the future. Sign me up for future news!